Time Spent: About 4-5 hours (not including extracting). I needed to think of the idea and it took me a long time to draw the mountains and get them to look right. Effects: There is nothing different from what I usually do, but this is the first wall I've done with the Japanese door style. The mountains and snow I drew with the pen tool. ^_^ I tried it several times before I got them to look right. The trees and grass and sakura petals are brushes. The wood is a texture. I gave the floor perspective so that it looks real. ^_^ The wall has about 30 layers. Oh yes, this is dedicated to my new friend Aqiaqua-chan. She is really improving in her walls and loves Tsubasa like I do. :) So I hope you like this wallpaper! Well the background of this wallie is very well done! Its so kawaii! wow! nice one kate-sama! love the scan + the bg! i like the sakura tree + the sky! great improvements! keep this up! XD + fav! what a lovely wallpaper! i love the effects in the background, and the scenery is very pretty =) awesome job on it! So I came to check it with my face looking like this: O___O? Aw, what a cute wallie! 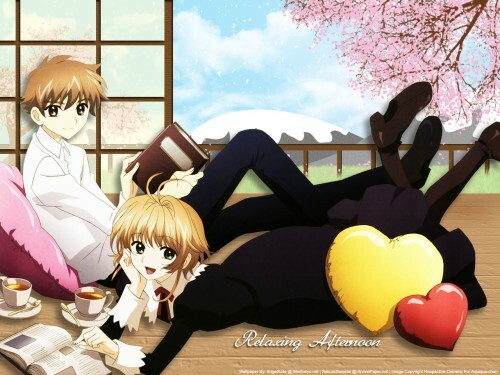 Nice scene of syaoran and sakura... both looks very cute and beautiful in the wallie. Liked the trees and the door, and about the floor I think it's a little blurry, but other than this, the wallie is very beautiful! Oh yes this is definitely cute! You did such a great job with the background! It is just so lovely! Pretty trees and sky and everything! Well great work again Kate! Very cute...I love the Japanese door and the trees, they look really good. Great job on extraction...however, for some reason those mountains bother me...:sweat: Anyways, its too cute...must add to favs! Very nice job on the scenery, it looks very nice. Jp-style door looks quite good and so do sakura trees. I only wish that it had more than one colour. The only major critique I have is that the mountain looks over-simplistic in comparison to the rest of the wall and the shape's a little bit odd. Either way, it's still a nice wall. Keep up the good work! Everything looks great, keep it up! Fave! Wow~ you did a great job creating such a beautiful background!